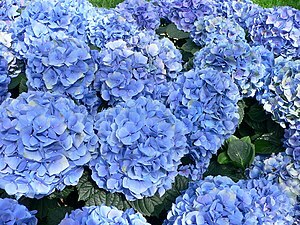 Where to Find Blue Hydrangea Flowers For a Summer Party? I am helping a customer with some custom stationery and coincidentally she needs blue hydrangea flowers for her upcoming party in July in Michigan. I live in the northeast and know nothing about Michigan, but I assume they can grow hydrangeas there since we can grow them here. I don’t run a flower shop or sell flowers (only images on paper) but I really wanted to help this woman out. My first bit of advice would be to check with a florist. Or maybe every florist you can find in your area. Florists have the scoop on cut flowers. Since the party will be in July, there certainly should be some flowers available. Hydrangea shrubs in the landscape will have flowers on them by then, so a greenhouse grower should certainly have blue hydrangeas for the flower shops. I would think so anyway. Also, I have mentioned this before, local nurseries fill their shops with hydrangeas (and especially blue ones) in time to sell for Mother’s Day in May. They won’t be cheap, but it might be a nice addition to have pretty, potted plants set around for the party. Afterwards they could always be planted in the yard. Next Post What Will I Find Beneath All That Snow?